There is great excitement in the office today as our engineers have developed a Virtual Reality (VR) simulation for an upcoming project. VR allows our engineers to assess the operations of a machine in a virtual manufacturing environment. A collaborative effort between our controls and design department was the key to the success of the simulation. Using ABB RobotStudio and a HTC Vive headset, our engineers can interact, simulate and immerse themselves within the automation environment. The benefits offered by VR means that we can create innovative solutions that continually advance the production capabilities of our customers. Machine designs and controls can be refined and optimised at an early stage. A virtual model of a machine can help our engineers to identify difficult robot trajectories. Additionally, optimum machine layout can be achieved, and robot operations can be analysed to obtain accurate cycle times before the machine assembly begins. 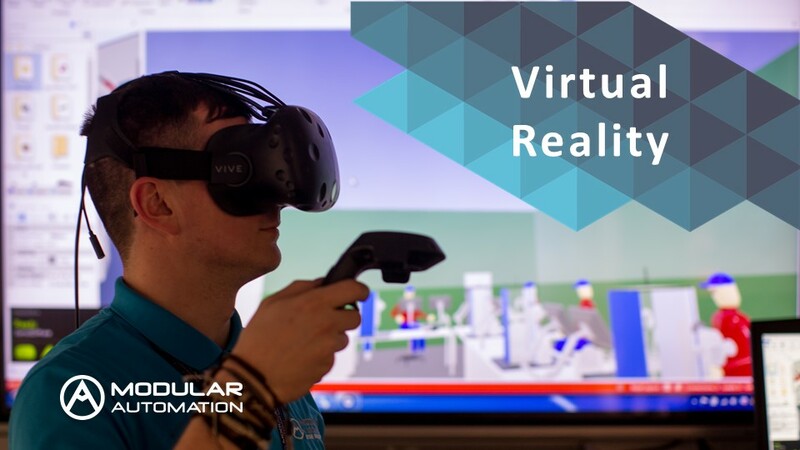 VR allows our customers to review their projects in the early stages of development giving them an insight to the capabilities of their bespoke automation solution. We are committed as a trusted, highly capable, automation partner who delivers exactly what advanced manufacturers need to continually advance their production capabilities.